This is a relic of the Chinese Qing Dynasty, and is made of pure silver. 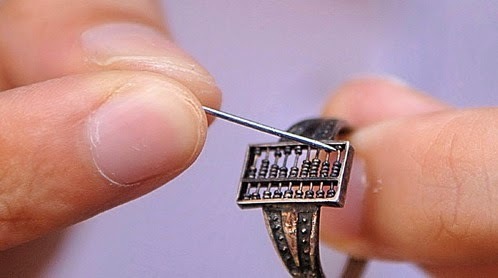 Inlaid in a ring like a decoration, the size of the abacus is 1 cm × 0.5 cm. It has seven rods and on each rod there are seven beads. 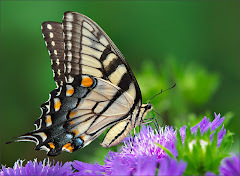 With a diameter of less than 1mm, the little beads are not made of filamentary silver, because they have no seams even when being examined under a microscope. More surprisingly, the beads can be moved easily and smoothly along the silver rods. For operating this tiny abacus, fingertips are too big. It seems that the beads can only be moved by small tools such as pins. However, this is no problem for this abacus’s primary user—the ancient Chinese lady, for she only needs to pick one from her many hairpins. More on the history of the abacus and examples of unusual ones at China Culture. I have an odd weakness for abaci; especially the more streamlined Japanese derivate of the suan pan (shown here), called soroban. I have several in my possession and both the visual and tactile aspect never fail to intrigue me. Learning how to operate one takes some getting used to, though. I quite agree; I had a nice one back in the early 1960s and rather enjoyed using it. how do you use a seven bead abacus? The abacus is shown upside down here, but the system is that each vertical rod represents a digit. The top two beads of each rod each have value 5; the bottom five beads each have value 1. In this way, each rod can represent a number from 0 to 16. For decimal calculations you only need digits 0-9, for which one top bead and four bottom beads are sufficient (which is why the Japanese version only has those). You can find a manual here (pdf).